Oct 19th: Flock of Space Ducks Caught on Camera! Title: Space Scoop: Flock of Space Ducks Caught on Camera! Have you ever been lucky enough to see a flock of ducks getting ready to fly to warmer climates for the winter? Sailing gracefully as a group, from one fascinating V-shaped pattern to the next? But if we look up much, much higher, above Earth’s atmosphere and far beyond, we can see another flock — the Wild Duck Cluster, an open cluster that is also called M11 or Messier 11. Unless you have the eyes of a hawk, you’ll need a telescope or a pair of binoculars to see this cluster of stars. Or a photograph, like the one in the album art for today’s episode! This beautiful picture shows the Wild Duck Cluster, as seen using the 2.2 meter telescope at La Silla Observatory in Chile. When seen from a distance the star cluster forms a spearhead shape, similar to ducks flying in formation. When you zoom in at high quality as we have for this photograph, the cluster kinda loses its pattern. Try looking at it out of focus to see the “V” shape. Studying open clusters is great way to test theories of stellar evolution, as the stars form from the same initial cloud of gas and dust and are therefore very similar to one another — they all have roughly the same age, roughly the same chemical composition, and are all roughly the same distance away from Earth. However, each star in the cluster has a different mass, with the more massive stars evolving much faster than their lower mass counterparts as they use up all of their hydrogen much sooner in the fusion reactions that all stars do. In this way, direct comparisons between the different evolutionary stages can be made within the same cluster: for example, does a 10 million year old star with the same mass as our Sun evolve in a different way compared to another star in the cluster that’s the same age, but half as massive? 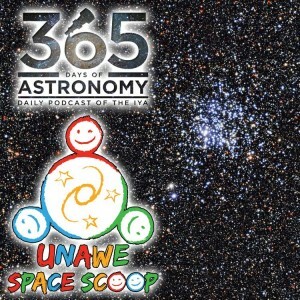 In this sense, open clusters are the closest thing astronomers have to “laboratory conditions”. Unfortunately, the stars inside this type of cluster are held together quite loosely and it doesn’t take much to scatter them. Sometimes it will be one rowdy member of the group that kicks stars out, other times they may be pulled out by the gravity of a star outside the cluster that’s passing by. Eventually, every star cluster will be pulled, pushed and distorted so much that all the stars fly far away and the cluster vanishes. But the length of time that a cluster survives varies wildly, from just a few million years to hundreds of millions of years. Their length of survival depends on how full the cluster is. Tightly packed clusters with many stars live the longest, which is lucky for the Wild Duck Cluster, because it contains over 3000 stars! The oldest example of this type of cluster thus far discovered is called Berkeley 17; it’s a whopping 10 to 13 billion years old!